When I started playing the guitar in 1979 (after hearing a certain Mark Knopfler playing Sultans of Swing) I wanted a Strat of course. At that time Fender made exactly one model – the “Stratocaster”, no Deluxe, Standard, Hot Rod, Super, Extra, and the like – only and simply the “Stratocaster”. On the other hand you had Japanese copies by a zillion of manufacturers it seems. At that time nobody knew that there were actually only a few Japanese companies who produced them and that they were marketed under many different names here in Germany or in the rest of the world. My first Strat was a 2nd-hand Fender Stratocaster from 1976 in sunburst with a black pickguard and white knobs. It was very heavy but looked pretty much like Mark Knopfler’s guitar – well, it was a real Strat – and differed only in details like the bigger headstock or the bigger Fender decal. Prices for a new Fender were about 900 – 1200,- DM (would be 450 – 600 €), while the Japanese copies were about 175 – 350 €. 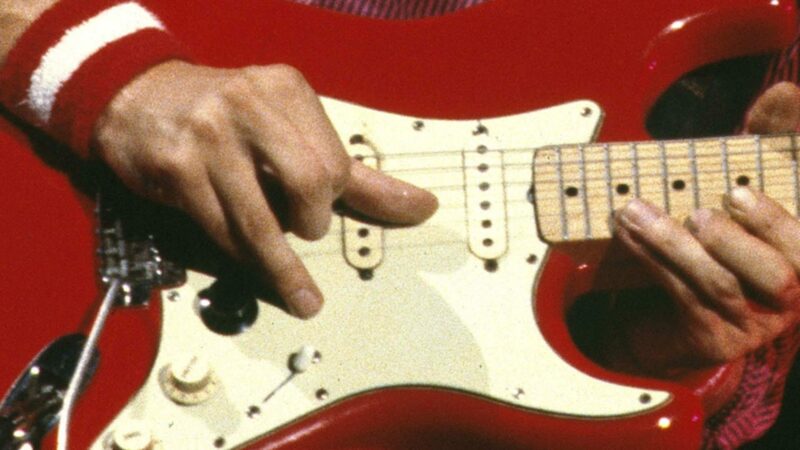 My first Japanese Strat was a Tokai: I was in a guitar shop and there was this fiesta red Strat (you never saw a red guitar because Fender had discontinued all red colours in the late 60ies !! ), it even had a small headstock like an early 60ies Strat (this was a sensation, all Strats and all copies had the big head), and it was feather light, played and sounded really cool. Even the decal with the Tokai logo looked like a Fender script logo! It was the perfect 1:1 copy of a ’64 Strat. Fortunately this was shortly before Christmas so I got this guitar (which cost the equivalent of 420,- €) for Christmas. It became my number one Strat then and sounded much better than my Fender. Soon after Fender reacted to these high-quality copies of vintage Strats in two different ways: a) they copied the ’57 and ’62 Strat themselves (the birth of the “Vintage Stratocaster” model) and b) they made a deal with the Fujigen Gakki company (who built e.g. Ibanez and Greco guitars) to produce a Japanese version of the vintage Strats for Fender. These were marketed under the name “Squier”. Both appeared about the same time in the shops here in Germany. I remember that we all were surprised that the Japanese Squier guitars did not sound inferior to the US versions, in the contrary, in many cases I liked them better. The first Squiers were available in three-tone sunburst (’62 model with rosewood fingerboard) and two-tone sunburst (’57 model with maple neck), but a few months later they were available in white, black and fiesta red as well. The fiesta red was too light and rather orange compared with the original, but it looked great! I bought a ’57 Squier Strat in fiesta red in 1983 which I will feature in one of the next articles. 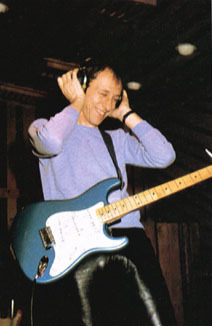 Mark Knopfler himself also got one of these Japanese vintage copies: a blue Fernandes Strat which he used for some stuff around the time of Love over Gold. John Suhr said that this guitar was one of the best-sounding guitars Mark had. Fender took legal actions against these copies and won, so about 1984 the period of ultra-close copying came to an end. In the last years prices for these guitars have gone up more and more, but with prices about 500 – 1000,- € they are still affordable. There are more and more websites dedicated to these Japanese vintage guitars, a sure sign that they are becoming cult guitars themselves. If you want a real 30ys old vintage guitar, look out for the Japanese Greco (“super real” series), Tokai (“springy sound”), Squier JV (JV for Japanes vintage, later Squiers came from Korea or other Asian countries), or Fernandes. I am sure it is not only a good investment but also a good chance to get a perfect sounding guitar. You are right, I had a Tokai in 1980s and it was great. I wish I never sold it. This blog is marvellous. So much good stuff! I hope that there´ll be also some examples about Mark´s favorite licks, scales, patterns. But if not, this blog is already very very good! By the way, how about your guitar amps? I remember this: it was a TV promo in Germany of So far away (playback mimic) during the BIA tour (probably a guitar borrowed for this purpose). I watched it on TV back then and had it on an old video tape ages ago, but haven’t watched it yet. I think Mark wore a pink jacket. Do you think your picture might be from this? Yes! It was exactly this photo. looking any info on the old Lincoln guitar brands…? 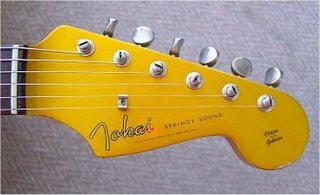 I have still my old 82‘ tokai springy sound, love it and probably will never sell ?